Vitamin A, a fat soluble vitamin, offers many benefits, including good vision, maintaining healthy mucus membranes, skeletal and soft tissue, skin, and teeth. And research has suggested that vitamin A may aid in development and growth, may improve immune function, may prevent some types of cancer, and may reduce the mortality rate from measles. 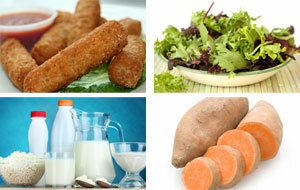 In foods, vitamin A is found in two forms: retinoids (retinal, retinol, and retinoic acid) and carotenes. Retinoids are found in animal liver, butter, eggs, some fortified foods, and whole milk. Carotenes—which can turn into a form of vitamin A—are found in dark-colored plant foods such as broccoli, cantaloupe, carrots, pink grapefruit, pumpkin, spinach, sweet potatoes, and winter squash. One carotene found in dark-colored plant foods is beta-carotene, an antioxidant that helps protect cells from free radical damage. Free radicals are believed to contribute to some chronic diseases and play a role in the aging process. Age and gender determines how much vitamin A is needed. The U.S. Institute for Medicine of the National Academy of Sciences has established recommended dietary allowance levels for vitamin A in order to prevent vitamin A deficiencies. Excess dosages of vitamin A can result in sickness and cause birth defects. Ask your doctor what dose is best for you.